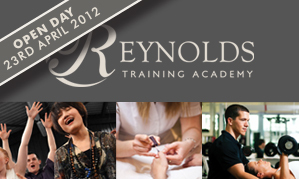 Come along to our open day on Monday 23rd April 2012 at Reynolds Training Academy in Dartford. If you are interested in Performing Arts, Beauty or Gym apprenticeships then this is perfect for you! The college timetable will be running as normal, so you get the opportunity to see the college at its best. There will also be the chance to meet with staff and students to discuss any questions you may have about any of our courses. You will be able to experience virtual tours of our various programmes in our skills room, and attend live presentations with open Q&A sessions during the day with senior management. Read more details about the open day here.